After less than one year of treatment, drug-resistant TB patient Gizachew has made remarkable progress. Ethiopia, GHC - The GHC / Ethiopian Federal Ministry of Health partnership program for drug-resistant TB has recently reported the best treatment outcomes in Sub-Saharan Africa, with ~80% of patients being cured of the disease. The Ethiopian GHC drug-resistant TB treatment program conducted in partnership with the Ethiopian Ministry of Health, with the support from the Jolie-Pitt Foundation, the Annenberg Foundation, the Eli Lilly drug-resistant TB Partnership, and the Lilly Foundation has made great strides since the initial enrollment of the first cohort of nine patients in February 2009. As of April 2016, 1454 patients have begun drug-resistant TB treatment, with approximately a quarter of the patients co-infected with HIV and a fifth of the patients being children and teens. Most patients present in the advanced stages of the diseases, having cycled through several prior TB treatments. The program’s partners are St. Peter’s TB Specialized Hospital in Addis Ababa and Gondar University Hospital in the north of country in Gondar, and Hossana and Irgalim Hospitals in the south. Though hospitalization is required to stabilize a proportion of these very ill and advanced group of patients, outpatient treatment initiation has also begun. 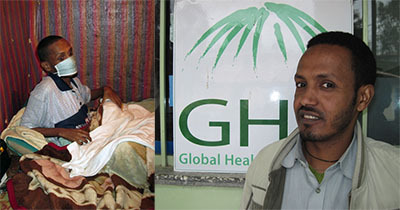 The vast majority of patients are treated in the ambulatory setting once stabilized, following the community-based model of care delivery learned from GHC’s many years of experience in Cambodia, adapted to the Ethiopian setting.